We take pride in our work and adhere to the strictest quality standards of truly green dry cleaning. – We use 100% biodegradable, non-toxic, and non-solvent, detergent-based solutions. – We recycle hangers and use recycled poly bags. – Our system is the safest for the environment: no carbon footprints, no harm to the ozone layer, and no contamination of the soil. – We use 30-40% less electricity and water compared to the average competitor. – Our dry cleaning is ideal for sensitive and infant skin. – Our system leaves no odors – only a fresh, clean scent. 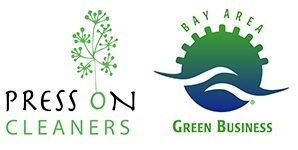 Press On Cleaners is a proud participant in the Bay Area Green Business Program. Our partnership of environmental agencies and utilities assists, offers incentives, and verifies that participating businesses conserve energy and water, minimize waste, prevent pollution, and shrink their carbon footprints. What is truly green dry cleaning? The main issue for dry cleaners is the toxicity of the process. The traditional solvent, Perchloroethylene (Perc) is still used by about 90 percent of the dry cleaning industry. It is a chlorinated solvent that accumulates in human body fat and is a known carcinogen. Perc has been shown to cause various cancers, respiratory illnesses and cause myriad health issues. Many dry cleaners have experienced firsthand the harmful effects of traditional dry cleaning solvents such as Perc through contamination of their land soil as well as serious health problems. Because of this, the California Air Resources Board has mandated a phase-out of Perc systems, which will begin in July 2010 and end by 2023. Because of these toxicity issues, a number of alternatives have emerged although there are questions regarding some of them. Some dry cleaners use a silicone based solvent otherwise known as “Green Earth,” but laboratory studies have shown tumor growths in mice. And many dry cleaners use a petroleum based solvent, “Hydro Carbon,” which is in fact a Volatile Organic Compound. So what are the best alternatives? Two options have emerged as safer alternatives: Professional wet cleaning and carbon dioxide cleaning (CO2). The professional wet cleaning system utilizes a special 100 percent biodegradable detergent, which is gentler than household detergents and acts as a solvent in conjunction with a gentle mechanical action to clean your clothes. Traditional machines that use harsh solvents often just “cover” your stains. This explains why white clothes return with a grayish tone. Professional Wet Cleaning also preserves better the color and fabric of clothing. Contrary to a mistaken belief, professional wet cleaning does not shrink clothes. Lastly, professional wet cleaning often utilizes citrus- and palm oil-based products in its pre-spotting process, which are also 100 percent biodegradable and safe for sensitive and infant skin. Carbon dioxide cleaning utilizes pressurized gaseous and liquid carbon dioxide in combination with special detergents to clean clothes. Similar to professional wet cleaning, CO2 uses a special mechanical action to prevent damage to clothing. The CO2 itself is composed of by-products of existing industrial processes. At the end of a cycle, the CO2 is pumped back into a storage tank and can be reused. This is the same carbon dioxide which at room temperature is used to carbonate soft drinks and in its solid form is also known as dry ice. These two systems also have the additional benefit of not generating toxic hazardous waste as volatile organic compounds (VOCs) do. Both professional wet cleaning and CO2 are approved by the EPA and are supported by many environmental protection advocates. It is important that consumers become aware of the harmful effects of traditional dry cleaning and the availability of safer alternatives. What should one look for? If the dry cleaner is exclusively using one of the two safer aforementioned systems, it can qualify for a Green Business Certification. Consumers can also encourage local cleaners to switch to safer pre-spotting alternatives or to switch completely to either the professional wet cleaning or CO2 methods. Julianna Mo is the co-owner of Snow White Dry Cleaners, a Certified Green Business in San Mateo County and city.